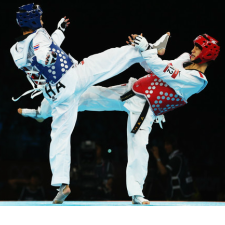 Tae Kwon Do is the world’s most popular martial art and the national sport of South Korea. 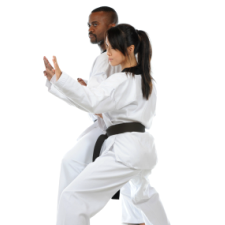 Tae Kwon Do is rooted in skills and tradition originating over two thousand years ago. It has been an Olympic event for over a decade. At Arlington Martial Arts, we teach Traditional Tae Kwon Do for self-defense, combat skills, exercise, and to become a better person. We stress Christian character qualities such as commitment, confidence, courage, discipline, endurance, friendship, gratefulness, obedience, patience, and responsibility. We partner with parents to grow kids who are strong in body and mind, empowering them to resist negative peer pressure or their own less-than-ideal leanings; kids who are focused, courageous, loving, and grateful; who know how to work hard, persevere, achieve and succeed. You see, it’s not easy growing up in today’s world. Children may be exposed to negative influences like bullying, inappropriate behavior, drugs and alcohol. They may also face personal temptations to be lazy, undisciplined, disrespectful or to underachieve. To combat these influences in your child’s life, martial arts helps to build up the inner person as well as the outer. It teaches children how to handle conflicts within themselves as well as without. It teaches respect for others by first showing them how to respect themselves. As adults, we often suffer from our sedentary yet stressful lives and jobs which can lead to weight gain and poor health. 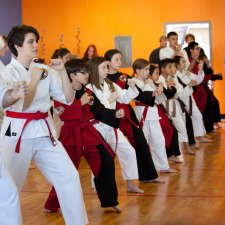 Our martial arts program leads to weight loss, improved health and stress reduction. Instruction for adults is a balance of exercise, martial arts, self-defense, knowledge and character development. “The family that kicks together sticks together!” Training in martial arts with your children strengthens your family. Spending fun, quality time with each other on a regular basis makes you healthier, stronger and more confident. Working together to help each family member be the best they can be is priceless, and the self-defense skills and resulting self-esteem are gifts you keep for a lifetime.